These meetings are therefore, somewhat depending on how busy your supervisors are otherwise, a unique opportunity for you to make use of your supervisors’ (research) experience. However, efficient use of the meetings requires preparation and planning, and in this post I share tips on how to prepare for and make the most of your supervisor meetings. As I’ve written about before, a Ph.D. project is long and with few deadlines, and one way of imposing your own deadlines is to make the supervisor meetings your regular deadlines. Make a status for your current work in preparing for the meeting, which will help you gain an overview and ease your presentation of the work to your supervisors, and think of it as a time by which something (not everything!) needs to be done. Since the beginning of my Ph.D. project I’ve had bi-weekly meetings with my supervisors, and while we changed the specific day and time a couple of times, these meetings have been fixed in all of our calendars throughout the project. And this, as I see it, is the right way to do it. I’ve heard of fellow Ph.D. students that rarely have meetings with their supervisors and that don’t have a fixed time for these meetings, and as a consequence they rarely sit down and discuss their research with the supervisors. They can, in principle, set up meetings with their supervisors “whenever there is a need for it”, but in practice – with busy and filled supervisor calendars – that is difficult. I therefore recommend that Ph.D. students suggest to the supervisors to have a fixed meeting time, for example every two weeks, to be sure that this time and place is allocated. Sometimes I cancel my own meetings, when there is no need to meet or when several of us cannot attend, but in my experience it works well to fix the time and place – to ensure that the meetings are held regularly. I usually have my supervisor meetings in the morning – as I find that time leading up to a meeting is often not very productive – and I prepare my notes and other material for the meeting in the afternoon and/or evening the day before. Initially in my project, I would sit down at this time and think of what I wanted us to discuss during the meeting, and this worked out. However, I realized that in the periods between the meetings, I would think of things I wanted us to discuss – an interesting article related to my research, a conference to potentially attend, administrative stuff for my project etc. – and I started to write these things down when I thought of them instead of waiting for the day before the meeting where I might have forgotten about it. For this purpose I have a “Meetings” notebook in the “PhD” stack in Evernote, and for each meeting I create a note herein where I write down these points. 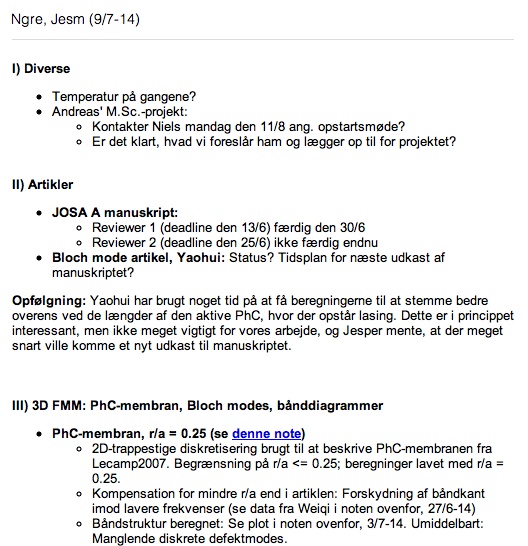 On the day before the meeting, I organize the points I have collected in the order I want us to discuss them, and you find an example in the picture below (meeting notes in Danish). Sometimes I write a follow-up (“Opfølgning”) in the note after the meeting, for example about decisions we make in the meeting. A lot of the data you obtain and collect in a Ph.D. project is temporary and not something you end up publishing or including in your Ph.D. dissertation – and for that reason it is tempting to never spend very much time on presenting these in pretty and illustrative plots. But I find a great satisfaction in taking my potentially very temporary data and spending a little more time than usual to plot them in a way that makes them look pretty, and which may help others to better understand my data. This may include to plot different data series in different colors, with different line styles and different data markers, to include axis labels and axis legends (in LaTeX font, of course!) and similar – all of which I more or less have a Matlab template for doing. This therefore doesn’t take very long, but it nevertheless makes me more happy about my work and my data. Sometimes I also generate a small illustration of the structure I’m considering and put it on top of the plot (see the tweet below), and I then bring this representation of my data for my supervisor meeting for us to discuss it. The particular data and plot in the tweet above are not going to get published or appear in my dissertation, but they are a step on the way and thus help me understand my work – and understand how to present them when I obtain the final data. When I have created several pretty and illustrative plots, I sometimes collect them in a slideshow presentation. Additionally, I add descriptions of what I did, my interpretations of the data, things I don’t understand, questions to be answered and everything else related to the work at hand, and this makes for a clear and thorough status report that I present at the meeting. Preparing such a presentation obviously takes time, and I don’t do it for all my meetings. But, as with the plots discussed in the previous section, I find it to be a satisfying way of summarizing the status of my work, and I often refer back to these presentations later on. An example of a recent supervisor meeting slideshow presentation can be found here. I carefully note all parameters used in my computations since these may be important if I refer back to the presentation at a later point. Sometimes, especially when I’ve been stuck in some part of my work for a while, I feel an urge to materialize my thoughts, ideas and questions, and a whiteboard – being a lot larger than a piece of paper – is the perfect means for expressing all of this and for creating an overview. As preparation for my supervisor meetings, I have a couple of times made such overviews on the whiteboard in my supervisor’s office and used it for presenting my work during the meeting. We also sometimes spontaneously use the whiteboard during the meetings, but when I’m stuck I find it to be better to prepare beforehand to be sure to give the right overview – as this is most likely to lead to a solution. Examples of these whiteboard meeting overviews can be seen in the tweets below. As mentioned initially, supervisor meetings are a time and place for you to have your supervisors’ undivided attention. You should therefore prepare to be able to update them on your work as quickly as possible and after that make decisions together with them. Decide very specifically what do to next; which structures or systems to investigate; whether you should focus on one or another part of your work; which figures to include in your manuscript; etc. The more specific, the better – and then write your joint decisions down to avoid forgetting what you decided.